First and foremost, this is not a photography-related post. It's just something fun I thought I'd share. If you own an Alexa device (Echo, Echo Plus, Echo Dot, etc. ), and you want to have some fun with your significant other/friends & family/roommate, then I'll let you in on a little prank you can pull on them. It will take some time to develop and implement this scheme, so start sorting out the details now if you want the big reveal to be around April Fool's Day. A couple of months ago, I had a moment of inspiration while sitting at my work desk and setting up our family's third Echo Dot. "What if I could make this Echo Dot say anything I wanted? That could be pretty funny," I thought to myself. And so my quest began. But first, a little backstory. My wife, Alexis, despises our Echo Dots. When we received our first Dot at the end of 2017, we changed its wake word to "Echo" because the default wake word, "Alexa," was too close to her name and she thought that could be confusing. Unfortunately, there are a lot of commonly used long-"o" sounding words in the English language, meaning that our Echo Dot often got triggered unintentionally, especially while watching TV. The frustration caused by the device's (now devices') inaccurate triggering was compounded by my wife's relatively private nature. "They're always listening. It's creepy," she would say. Our first Dot was placed in the living room, and we did find it useful for controlling the lamp that provides the primary illumination for the room (the lamp is connected to a smart plug). Being able to turn the living room lamp on and off without having to leave the couch proved very convenient, so the pros of having the device seemed to outweigh the cons. When a sale on Echo Dots rolled around, we added another Dot to our kitchen which proved useful for adding items to our shopping list. This past Christmas (during another sale), my moher sent us another Echo Dot for my photography studio. I will likely use it to control the window air conditioner without having to leave my desk chair once the warmer weather rolls in. Oh, the conveniences of the twenty-first century are indeed marvelous. But what if we got a peak at the darker side of these amazing devices? That's what I wanted to explore. If I could figure out a way to get my Echo Dots to say very precise, well-timed responses, then I could make it look like the devices were much more of an invasion of privacy than what they actually were. But I first had to figure out how to manipulate the devices to do my bidding. A little bit of Google research showed this wasn't the first time a person has wanted to make their Amazon Alexa device say custom statements. One site suggested that you sign up for the Amazon App development program so that you had access to Alexa and Echo app development testing platforms. But the steps involved in registering to be a developer made that solution less than desireable. And then I stumbled upon TextToVoice.io,i.e., exactly what I was looking for. 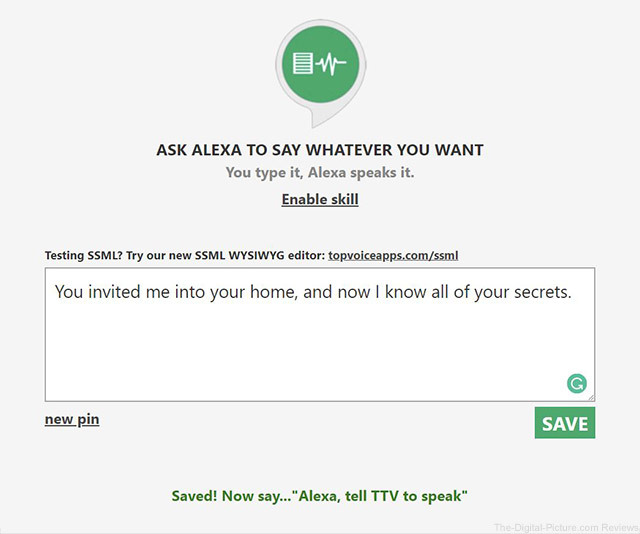 TextToVoice.io is an Alexa skill that enables you to type speech commands into your browser and send them to your Alexa device. With the skill enabled, that familiar Amazon Alexa voice will say [just about] anything you wish using the wake word (in my case, "Echo," but by default, "Alexa") and "Tell TTV to speak." While that's a neat trick, in order for this prank to work, we need the device to say things without being prompted to "Tell TTV to speak." So the next hurdle to overcome is recording the Echo Dot (or Alexa device's) voice while she's saying the custom message. There are actually several ways to tackle that problem, but I'll describe the two that worked well for me (I tried multiple ways just so that a wide variety of people could benefit from theis scheme) and a backup way I didn't attempt. First, you can use a 3.5mm to 3.5mm cord to plug your Amazon device directly into your computer's microphone jack. Press the record button, then say "[Wake word], tell TTV to Speak." When the sound finishes playing, stop the recording. Note that TTV will say your custom text, pause and then ask if you want to hear the response again. Just stop the recording after the first long pause or later delete the unwanted portion after your desired response. Using Audacity, a free audio editing program, you can record the output of the device and save it as a WAVE file (or .MP3, if you install an optional LAME encoder). Second, you use the same 3.5mm to 3.5mm cable and a portable audio recorder (Zoom H2n, Tascam DR-07X) to record your custom message, which will then need to be transferred (via card reader) to your computer. Third is to use a portable audio recorder's (or possibly a phone's) microphone placed near your Amazon device and record the audio that way. As this won't produce a clean recording (ambient sounds may be captured), this is not the recommended approach. No matter how you record the audio, you'll likely need to edit the file to make it optimal for playback (Audacity works great for this). You will likely need to amplify the sound (using the Amplify filter feature), add a few seconds of silence to the beginning of the track and delete any TTV prompts afer your custom message. The reason for adding a period of silence at the beginning of these files is because they will be sent to the Amazon device from your smartphone, and you don't want the device saying odd things right as you push a button on your phone. By adding 3-5 seconds of silence to the beginning of each custom message, you have time to put your phone down and/or begin a conversation with your mark which could be interpreted as the catalyst for triggering the device's custom response. What kinds of custom prompts should you create? That's where you can have a lot of fun with this. I suggest starting small and building up to bolder statements. Also, making your device make references to other Amazon products aids in this pranks believability. During a three week span, I played all of the following custom messages on our living room Echo Dot while my wife was in the room. "Would you like me to play lullaby music to soothe a crying baby?" "The weather is very cold. Your baby will probably need a jacket today." "It seems a bit chilly in here. Would you like to order a smart thermostat from the Amazon Store?" "I sense that you're leaving for work. Would you like for me to read you a book along the way. Just select a title from the Amazon Alexa app on your smart device." "It sounds like you're having a bad day. Would you like me to play some soothing music so you can relax?" "Did you receive your tax documents from Morgan Stanley and Wells Fargo? If so, you may be ready to do your taxes. Turbo Tax is highly rated and available at the Amazon Store. Would you like me to purchase the version that's appropriate for your financial needs and family of three?" Apparently, Amazon mentioning two banks we have accounts with was a bit too much for her. After that, I had to let her in on the joke or she would have chucked all our Alexa devices in the trash bin outside the house. I'd like to say that we had a good laugh about the prank and that she was impressed by the effort I had put into it, but I think that would require a genial, fun-loving, carefree sense of humor that my wife wasn't necessarily born with. Our couch is actually a quite comfortable place to sleep, thank you very much. Moving on. Note that with my wife already being annoyed with our Echo devices, I knew she wouldn't say "Yes" to any of Amazon's supposed offers to help (she did say "No" rather emphatically to all of them, though). If she had, the device would not have responded. In the unlikely case of an affirmative response, you can prompt your Amazon device to perform the appropriate task ("Alexa, play some soothing music. "), as if the device didn't hear the mark's affirmative response. Once you have the files recorded, you'll need to get them on your smartphone or smart device. Being an Android user, I found WiFi File Explorer PRO to be the best method for transferring files from my computer to my phone. Otherwise, you can likely use a data cable or Dropbox/cloud storage solution to do the same thing. In the left side menu, click "Settings." Scroll down to the General section and click "Alexa Voice Responses"
Open the Alexa app on your Android phone or iPhone. Tap the menu button on the top left of the app. Tap “Alexa Account” at the top of the screen. Enable the “Whispered Responses” mode. With that done, you'll need to set up each device for whispered responses. The first time you whisper to a device (it works best if you're very close to the unit), it'll ask if you want to turn on the feature for that specific device. Say "Yes" and you're ready to go. I found the whisper feature to be crucial for discreetly connecting my phone while my wife was in another room. The feature has also been handy when a sleeping baby is nearby. Also, after connecting your phone, you'll want to make sure the volume setting for playback on the connected device is at its maximum level. If it's not, your mark may not be able to hear the message (that happened to me a couple of times). Record custom messages and edit them accordingly. Enable "Whispered Responses" for your Alexa devices. Connect your phone to the Alexa device and play the custom message(s) at an opportune time. After you get everything in place, it's a good idea to conduct a trial run without your mark around so that you can work out an issues. You may find that you need to amplify your recorded message a little more to match the volume level of Alexa's natural responses. 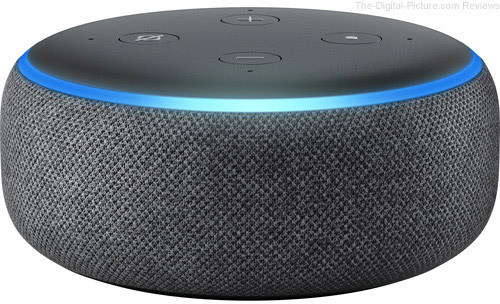 Otherwise, you may find that your smart device refuses to connect to the Alexa device at full volume, requiring that you adjust the volume level each time you connect. One downside to this prank is that the device will not light up during the custom message's playback like it would if Alexa were really speaking. Many people may not notice the difference, but if you think your mark will, you might try putting some objects around the device to block their view of it. My wife still has Christmas cards all around our living room Echo Dot (making it practically invisible), so she never noticed the LED light discrepancy. So there you have it, the best prank I could come up with to share with you before April Fool's Day rolls around. If you decide to follow the steps above, send us an email to let us now how it went. I'd enjoy knowing if you had as much fun as I did and how long you let the prank endure.